Baby Alligators at a farm in the Florida Everglades. See post about it here. Close-up of a knitted purse with red beads. Paddleboarding in January with the Boogedy during a visit from Uncle Kirk. Pink flowers from the great big bush near our local playground. Their leaves fold up at night. Mangoes from our neighbor’s tree, Key West Florida. A close-up of a hand-knitted stocking for Zach, x-mas 2010. A rain-bedraggled hibiscus in my Key West garden. Rain on a palm front outside my bedroom window, Panama City Beach, Florida. A close-up from my favorite project ever, “Fingerless Blitz-ens”, story and more photos here. A detail of a hideous baby hat (made with gorgeous yarn!) that I won’t be giving away. This is a peek into a “stash-busting” project I am currently working on. I’ll post the finished product as soon as it’s ready. A box elder bug seen on the sidewalk on a warmish spring day, 3/4/09. This is a detail of a hat I made for Jeremiah. See the whole thing here. This is a great fabric I’ve had in my stash for a few years. I’ll find out who made it if you ask! This is a detail of some gorgeous orchids on my desk. This is a detail from the quilt that covers my bed now “Six Years in Purgatory”. I started this quilt in 2001 and finished in 2007. During the majority of that time, it was a finished quilt top, lacking only to be tied and bound. It spend those years in a cardboard box, moving from here to there all over San Francisco and LA. It now matches my bedroom perfectly (I have daiquiri ice colored walls!). 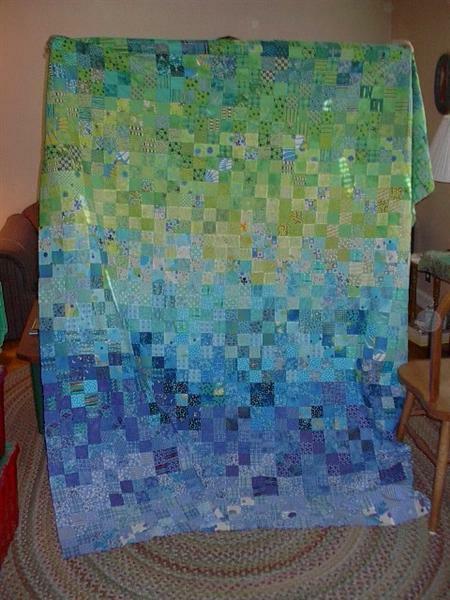 Here is an OLD photo: a full view of the unfinished quilt…the colors are much more vibrant in real life. We went for a hike in Zion National Park on Memorial Day. I snapped this photo of a young horsetail plant. I love how it looked, so bright and vibrant against the redrock. This header shows the blooms of a plant that hangs above my desk. The perfectly star-shaped blossoms have a central pink part that looks just like czech glass beads.